There are 5 posts tagged google. Because there’s nothing like an apology that comes straight from the marketing team. But really, I’m happy it’s straightened out and a little freaked out that I was 100% sure that this was how it was going to play out. It’s the most useless sort of psychic ability. The song and a little story about the Google Maps Debacle was on the front page [below the fold] of the local paper and I was at an event wearing a nametag today and someone recognized my name and said “You’re that lady who wrote the poem” and I could have kissed her. Home stretch week here. I am retiring to bed with a printed manuscript–don’t hate me trees–and a red pen to look for typos and outline what is left to be done. The other Jessamyn West also wrote in bed, though she did it longhand. I am lucky that I can stand my own creative output [I must have listened to that “Hey Google” song a hundred times] because I’m surrounded by it lately. Manuscript ships out June 30… oh wait this is a long month… ONE MORE DAY. It’s drama in real life here, folks. I’ll report back when I’m finished. In some way I think I knew it was coming and so hurried up my efforts to appear to be hurrying it along. Once I’d written the song, someone passed it on to a friend and the next thing you know the Time Magazine blog, Techland called me about it asking “Is there a video we can link?” And of course I’d been meaning to do one… so I spent an hour or two putting this together, they wrote a nice piece and linked to it and tweeted about it which caught the attention of someone at Google Maps who got to play the hero and fix it practically while we watched [while at the same time entreating us to use the “report a problem” link as if that’s all we had to do in the first place]. So the system works, sort of. By that I mean that people who can be adorable and agitate politely to get their problem fixed by making use of their high placed connections can really get things done. Was the world ever any different? I’d feel slightly better if I felt that I’d improved the overall system and not just my place in it, but I think being any sort of activist means always remaining a little dissatisfied. It’s pretty cool to see my town in the right place again. I dropped the local paper’s editor a note about it. 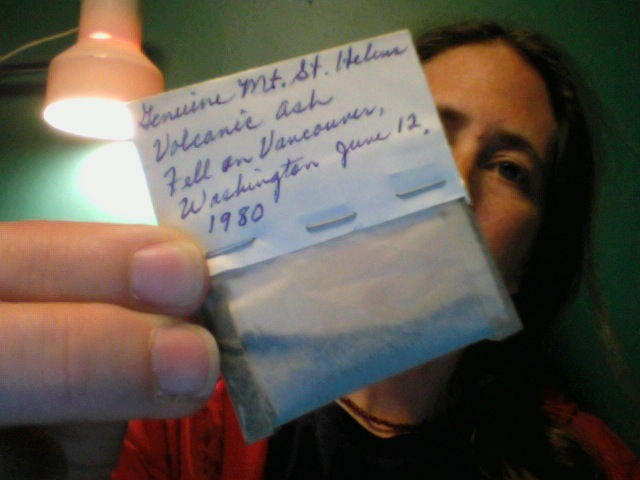 My grandmother sent me a little packet of ash that had fallen on Mount Saint Helens back in 1980 when she was visiting Washington state, well before I’d ever considered living there. It stayed in my pink jewelry box [shut up] and somehow managed to come along with me this whole time until now it’s on the little shelf on my dresser along with a wire sculpture a friend made, a portion of a Buddha from Afghanistan and an orange fuzzy thing with googly eyes, all things that survived the many deaccessioning stages that I’ve gone through. And today is the 30th anniversary of the main eruption (though the ash is from a few weeks later) and the internet can bring all those photos back, pictures that I only remember seeing in the Boston Globe, in print, back when I was eleven. I am still writing. I’m in the word count range where the numbers of words I’ve typed can be represented as zip codes, moving roughly westwards, usually. I typed from South Bend Indiana to Flint Michigan today. Sometimes I wind up in Spain. My town is, as always, underwater and I am out of ideas to get Google to repair it. I am working on a catchy jingle. I hope they like it. We got word back that our issue has been escalated–apparently it’s happening to bigger towns than ours, all over the world–but nothing really. I tell people who are maybe coming here to make sure they type in the street address if they want to know where I actually live. And I guess I’ll wait, bemusedly, and entertain people on Twitter about it in the meantime. And I’m skipping town. Not as a result of this obviously, but because it’s school vacation week. Jim and Milo are going to visit his folks in Arizona and I’m going to swing by for a few days. After all of the rain [and snow!] here in the last week, getting a little ninety degree desert time sounds nice, and I’ll be heading homewards before it starts to grate on me. It’s been a while since I’ve been in Arizona. I am looking forward to it. And more on this in a while, but I reaized via some egosurfing that my book is actually available for pre-order from Amazon.com, despite the fact that it’s not even really written yet. Yes I know it’s expensive. You will not hurt my feelings if you don’t buy it. I was discussing with friends lately how the 1890s is my favorite decade. 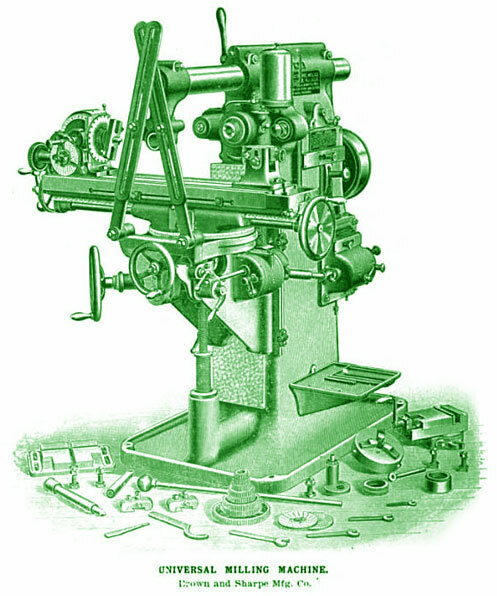 Back when this blog was just a teeny “what I did today” ramble, I’d take machine shop photos and colorize them so that I could have images to use next to some of my posts. This usually involved, in the late 1990s, taking a photograph of a book. Well now I can go go Google and read an entire book from 1895 full of fun machine pictures and even add it to my so-called bookshelf. Nothing has been going on this week other than the normal stuff. I have had a cold and have been doing the lay low thing in addition to my usual work. I got very “rah rah” about blogging stuff when I was doing it for BoingBoing, but coming back to my little “hey here’s what’s been up” box that I type into does not make me want to go off and research 19th century dictionary advertisements [though I have a great old advertisement for one]. Here are the photos of my trip to Florida. I had a nice time.